The holmium:yttrium aluminum garnet (Ho:YAG, holmium) laser is an intracorporeal lithotrite that is widely used in the surgical management of urinary lithiasis. The Ho:YAG laser is capable of fragmenting urinary stones of all compositions while maintaining a wide margin of safety. The 2140-nm wavelength of energy is transmitted from the generator to the stone using specialized silica optical fibers. The effectiveness of the laser can be impacted by the type of laser fiber used, the pulse energy and frequency settings, and the composition of the stone. 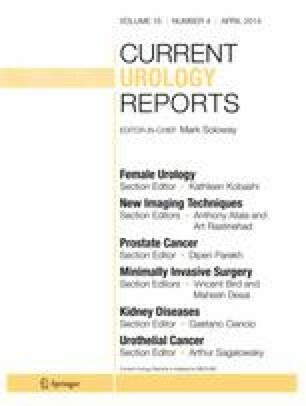 This paper provides an overview of Ho:YAG laser fibers utilized for lithotripsy during ureteroscopy. We will also review current data regarding optimal energy settings and discuss our experience with different fragmentation techniques. Dr. Abhishek P. Patel declares no potential conflicts of interest relevant to this article. Dr. Bodo E. Knudsen is a consultant for Boston Scientific and Olympus Surgical.